Burtis Chiropractic suggests the dietary supplement Metagest or Pan5x. They are both a high quality pharmaceutical grade supplement. 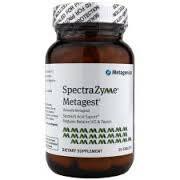 Metagest features betaine HCI blended with pepsin to balance the natural production of digestive agents in the stomach helping break down food. 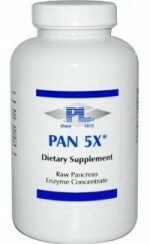 Pan5x is designed to be used as an enzymatic aid for the digestive system. It assists the pancreas in providing carbohydrate, fat, and protein-digesting enzymes. Once the food enters the stomach, hydrochloric acid (HCI) and pepsin take over to process what is left of the food. For many of us, this is a lot more than 25 percent of our initial meal since eating as quickly as possible and swallowing large pieces of food has become a common routine. When the food enters the stomach with a lack of enzymes it attempts to overcompensate with stomach acid. Having an abundance of acid can cause acid reflux in which the stomach contents leak back in to the esophagus. This causes irritation resulting in heartburn in addition to other symptoms. Merely taking antacids doesn’t really get to the bottom of the problem; it simply reduces one of the symptoms. It can also negatively pass even more poorly digested food into the intestinal tract. This then triggers gas, bloating, bad digestion, and chronic digestive disorders. Burtis Chiropractic suggests taking a dietary supplement to aid the digestive system as it can have future benefits as well. If you spend years forcing your body to massively overproduce stomach acid to compensate for the lack of enzymes in your diet, your body’s capacity to produce stomach acid begins to fade. This health consequent can be profound. Therefore, aiding your digestive system in properly digesting food is imperative. It is also fairly common to have a low production of stomach acid and with age it becomes more prevalent. Nearly 40 percent of the population is affected by age 40, and it’s an estimated 50 percent by the age of 60. Persons who visit the doctor’s office have a 90 percent likelihood of having low stomach acid if over the age of 40. Gas, bloating, belching, diarrhea/constipation, autoimmune disorders, skin diseases, rheumatoid arthritis, and a host of intestinal disorders, such as Crohn’s and Irritable Bowel Syndrome (IBS) – Caused by inadequate acidity to make pepsin effective in breaking down foods. Food allergies – In people with food allergies low acid production in the stomach is estimated to cause 80 percent of the cases. Inability to properly absorb many vitamins and minerals including: calcium, iron, vitamin B12, and folic acid. Vitamin B12 in particular requires sufficient stomach acid for proper utilization. Without that acid, sereve B12 deficiency can result. Harmful bacteria and parasites in the stomach – With low acidity and the presence of undigested food, harmful bacteria are more likely to colonize in the stomach and interfere with digestion. Normal levels of stomach acid are required to keep this from occurring.